The Vitaphysical centre is a short journey from West Rainton and offers osteopathy and massage treatments to relieve your body’s aches and pains. If you suffer from chronic pain in your back, wrist, hip or have shoulder freeze, our experienced practitioners can help. Each member of the Vitaphysical team is a qualified professional and comes with their own individual specialism, allowing us to successfully treat a host of conditions. 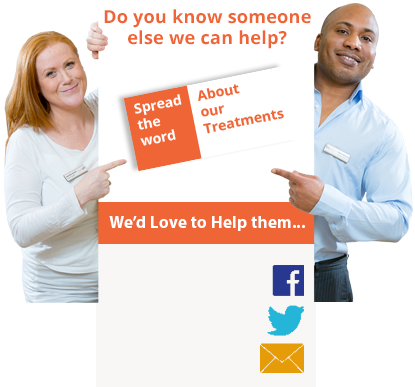 You’ll find a list of the conditions we work with on our what we treat page. If your ailment or complaint isn’t included in the list please do call us for a free telephone consultation, we will likely have experience of treating your problems and will be able to suggest the best treatment and therapist for you based on the information you share. Our massage therapies focus on repair, rejuvenation and relaxation. With a choice of full body massage, Thai massage, deep tissue massage and sports massage, you can choose to have your aches and pains soothed away and work towards restoring function and movement after accident or injury. We also offer pregnancy massage, designed to relax mums to be and ease discomfort. We’re very proud of the high service satisfaction level among our customers. Many of our patients come to Vitaphysical after undergoing other types of treatment such as physio or private chiropractor sessions, which have provided limited success. We’ve shared a number of our patient success stories here on our website and are pleased to offer a 100 % money back guarantee on all of our massage and osteopath services, giving you extra peace of mind. First time visitors can also take advantage of our downloadable discounts, which can be redeemed on your first appointment. To make a booking, contact us via email at info@vitaphysical.co.uk, telephone us on 0191 565 886 or use our online booking form. We offer a number of emergency appointments for those extreme cases when intense pain strikes without warning – get in touch and we will usually be able to arrange to see you the same day or at least within 24 hours. Vitaphysical’s osteopathy and massage centre is located on John Street Sunderland, 20 minutes from West Rainton. If you wish to travel by car, you’ll find further details on our how to find us page. Free patient parking is usually available on site. We look forward to welcoming you for treatment at the Vitaphysical centre soon.